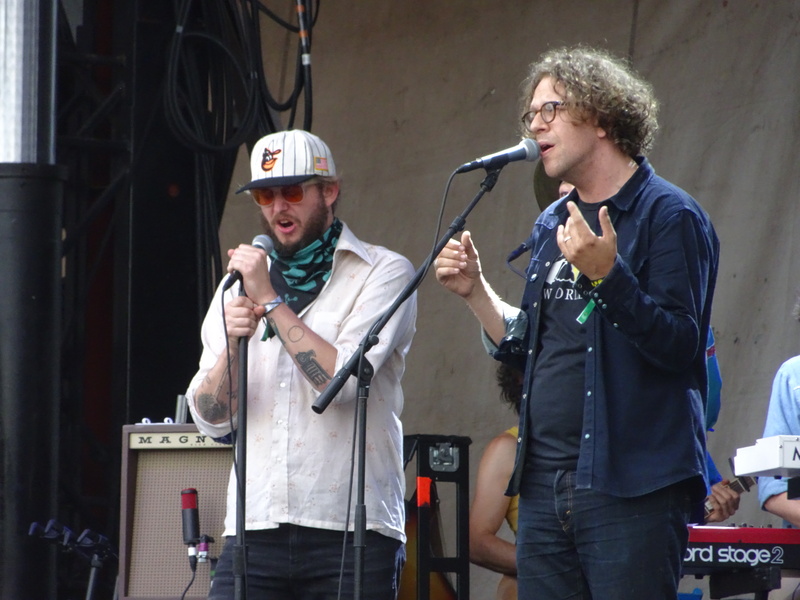 Justin Vernon, left, and Phil Cook pay tribute to John Prine at Eaux Claires. A heavy summer rain pelted Eaux Claires festival goers Friday evening as they watched Justin Vernon pay tribute to country/folk singer-songwriter John Prine. Vernon, festival co-curator and frontman of Bon Iver, led a “Great American Songbook” a 90-minute set featuring Phil Cook, The Staves and other Artists-In-Residence and didn’t let it dampen the mood in Eau Claire, Wis.
Prine joined Vernon and the others toward the end of the set and played “Hello in There” as well as few other favorites. Outside of the Prine tribute, attendees watched Chance the Rapper give an energetic, danceable performance as the night’s headliner. “This festival is not like any other festival,” said the Grammy-winning artist. A performance highlight included a collaboration between Chance the Rapper and Francis & The Lights called “May I Have This Dance,” which sounds like it was inspired by Peter Gabriel. Friday also served as Wilco side project day with The Autumn Defense, Tweedy, Cup and S. Carey and Glenn Kotche. Later in the day, Jeff Tweedy and his son, Spencer Tweedy, played the Tweedy favorite, “Summer Noon,” on the Flambeaux stage, while Wilco guitarist Nels Cline and his wife, Yuka Honda, performed their ambient music as Cup at the intimate Sparreaux stage. At nightfall, attendees grooved on the lawn to Durham, N.C.-based indie pop duo Sylvan Esso, who drew their energy from the wet, but enthusiastic crowd. Songs like “Coffee,” “Hey Mami,” “Die Young” and “Radio” were crowd favorites as Amelia Meath and Nick Sanborn performed their 60-minute set. “Thank you for buying a ticket to one of the only festivals that’s a true celebration of music,” Sanborn said.